Throw a rock at a TV and you’ll find a series involving crime/law enforcement. Blindspot tries to bring something new to the game with a central character who comes with a mysterious past. 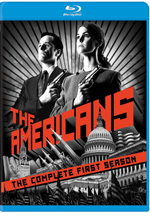 This four-disc Blu-ray set contains all of Season One’s 23 episodes. The plot synopses come straight from the packaging. Pilot episodes usually embrace exposition above all else, and that becomes the case here, as the show exists mainly to set up lead characters and various situations. I’m fine with that narrative choice, but I could live without the program’s frantic visual style. Too much of the episode feels “urgent”, and that will get old fast. “Pilot” sets up the series well enough, though. For a series that at least partially revolves around the mystery of Jane’s identity, “Howl” seems eager to spill those beans right away. Of course, this episode’s potential revelation may be a red herring, but if not, it seems like a strange choice. The rest of “Howl” feels like an extension of the “Pilot”, for good or for ill. 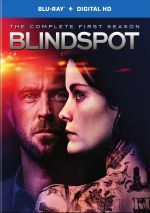 So far Blindspot leaves me a little cold, but I hope to see improvements. Only three episodes into Season One and I already feel fatigued. The series seems to want to make each program an action film in its own right, which sounds fine on the surface, but it leads to a series that lacks variety. Can’t we get a story without massive violence and world-threatening events? “Rot” offers arguably the series’ best episode to date, partly because it allows some supporting characters room to expand. The addition of Patterson’s side adds life, and the show hints at other developments. Perhaps “Rot” will lead toward greater pleasures in the future. For the most part, “Law” offers a decent twist on the bank hostage tale. Parts of it sag – mainly when it gets sappy via the Weller/Jane story – but it gives us enough action and intrigue to become a fairly good show. While aspects of Blindspot entertain, the series suffers from a muddled overall narrative. The show seems to want to point somewhere, and I suspect this will tie together eventually, but so far, it all feels awfully random. “Soul” sputters as it keeps things too vague for my liking. “Tour” benefits from two elements. I like the infiltration of the militia’s territory, as the shift from the usual city confines adds zest. In addition, Phillips offers a lively performance as the episode’s baddie. These add up to make this a better than usual program. Back in NYC, “Envoys” regresses after the strides of “Tour”. While it attempts more of a topical feel with its commentary on rogue cops, it seems more than a little muddled. We do get some useful backstory, but the episode lacks a lot of entertainment value. Is the Jane/Weller romantic subplot inevitable? Apparently – I guess a TV series can’t place two attractive people together without forcing them into potential smoochy time. I really wish Blindspot had avoided that trite choice, though, as the Jane/Weller relationship becomes a real drag on the series. Despite that, “Flirt” turns into a pretty good episode. It eschews the series’ usual manic tendencies much of the time to focus more on a spy thriller vibe, and that change of pace allows it to bring us an entertaining twist. “Flirt” ended with the death of a regular character, and “Instrument” follows the aftermath – to some degree. Not exactly a contemplative series, Blindspot won’t take the time to dwell on emotion, so it mostly focuses on the usual investigative intrigue. That leaves it as a fairly average show, though it does pack some revelations at its end. In a series largely populated with alpha males and females, the introduction of John Hodgman as a conniving bureaucrat becomes a welcome addition, as the show needs someone quirky. The rest of the episode seems more traditional, though I do like the excursion from NYC – I always appreciate shifts in terrain. The most interesting aspects of “Fortune” hint at Jane’s “origins” and show us others like her. That side of things works, but the rest feels fairly “standard issue”, as the episode emphasizes the series’ usual frantic antics. That latter character comes to the fore in this unusual episode – well, unusual for Blindspot, as it eschews the standard level of action and mayhem. I appreciate that change, as I’m happy to see something more subdued and less hyperactive for once. “Youth” manages to move along plot elements well. The farther into Season One we go, the less the series seems to focus on Jane – which is good and bad. On the positive side, I appreciate the extra breadth we find, especially since the “tattoo of the week” premise threatened to get old. On the other hand, though, the series lacks a lot of narrative clarity. The overriding theme of Jane’s identity/motives still exists, but it gets obscured, and that lack of development makes S1’s overall impression less clear. Still, I’ve enjoyed Blindspot more and more since it lost the heavy emphasis on Jane’s issues, so I won’t complain. “Rules” gives us another fairly good show that deepens the supporting characters and situations. Initially, “Canyon” looks like it might give us more of a comedic feel than usual, as it appears to mock the pretensions of the art world. However, that avenue fails to receive exploration, so the episode sticks with the usual frantic action most of the time. It moves along the overall narrative acceptably well but it lacks the zing to stand out from the other shows. At the episode’s start, it looks like “Thief” might actually take a fairly character-focused, contemplative approach. That doesn’t last, of course, as the show quickly shifts to mayhem and action. Some intriguing moments still emerge, but I admit the series’ “all climax, all the time” bent gets a little old. Patterson offers arguably the series’ most engaging regular character, so I like this episode’s emphasis on her. Granted, it uses a somewhat contrived way to explore this, but “Lookouts” nonetheless manages to go down some interesting avenues. These allow it to become a solid program with some good twists. In a series packed with somber characters, Rich comes as a breath of fresh air. Sure, we’ve seen personalities like him many times elsewhere, but I still welcome anyone quirky. Combine Rich with a fun heist theme and you get a better than average episode. After the semi-comedy of “Technique”, “Comet” reverts to the series’ standard action-oriented bent. In this case, I don’t view that as a bad thing, for the episode’s focus on a campus shooting gives it an interesting twist. A third-level character, Dr. Borden gets a rare moment in the spotlight here – and doesn’t add much. He feels too much like an expository device and fails to help the episode develop. While it comes with a few intriguing elements, “Stone” seems a bit lackluster overall – and the contrived semi-flirting between Borden and Patterson doesn’t help. The lockdown gives the episode some tension, but it seems to exist mainly to force characters to talk to each other. Despite the contrived nature of this choice, I appreciate any shift from the series’ usual manic nature. The exposition may be clumsy, but it adds a little depth – and I like the comedy from a freaked-out woman trapped in an elevator with Reade and Sarah. As Season One draws to a close, “Render” follows a mix of plot elements intended to ramp up the tension and action. For the most part, it does so fairly well, even if I do still occasionally wonder what the series’ overall narrative intends to be. Muddled threads aside, “Render” pushes toward the finale in a positive manner. After all the drama to date, Season One ends with even more theatrics – and it does so reasonably well. “Await” provides answers to a mix of burning questions – not always great answers, but answers nonetheless. This leaves “Await” as a pretty good finish to a pretty good series. Blindspot struggled at its outset and took a while to get into a groove, but once it did, it became reasonably entertaining. While I don’t think it offers a great series, Blindspot manages to offer something mostly engaging. Blindspot appears in an aspect ratio of approximately 1.78:1 on this Blu-Ray Disc. From start to finish, the episodes looked good. Expect fairly positive audio from the DTS-HD MA 5.1 soundtrack of Blindspot. The forward dominated, as the shows featured solid stereo music and a good sense of environment. Elements meshed smoothly and moved across the spectrum well. Among extras, we get an audio commentary for the “Pilot”. It offers a running, screen-specific chat from series creator/writer/executive producer Martin Gero and director Mark Pellington. They offer a running, screen-specific look at the series' early challenges, story/character areas, cast and performances, locations, camerawork, music, editing, and connected domains. While the commentary comes with a reasonable amount of information, it suffers from an awful lot of happy talk. We get praise for much of the episode, and that factor crowds out the spots where useful material can emerge. This isn't a bad track, but it disappoints. Deleted Scenes accompany 11 episodes. We find clips for “Pilot” (1 scene, 0:52), “A Stray Howl” (3, 5:36), “Cede Your Soul” (4, 5:38), “Sent On Tour” (1, 1:27). “Persecute Envoys” (1, 2:19), “Authentic Flirt” (3, 3:35), “Evil Handmade Instrument” (1, 1:36), “Scientists Hollow Fortune” (2, 1:45), “Rules In Defiance” (1, 2:43), “Mans Telepathic Loyal Lookouts” (1, 1:32), and “Of Whose Uneasy Route” (1, 1:24). The majority of the snippets tend toward minor exposition and small character beats. Some of these seem more interesting than others, of course, but I can’t say any of them offer much that would add to the shows. Note that all the sequences come with intros from series creator Martin Gero – those pad the runtimes. He gives us good background for the clips and lets us know why he cut them. Disc Four includes a mix of featurettes. Casting the Team runs nine minutes, 54 seconds and provides comments from Gero, executive producers Greg Berlanti and Sarah Schechter, and actors Jaimie Alexander, Sullivan Stapleton, Marianne Jean-Baptiste, Rob Brown, Ashley Johnson and Audrey Esparza. As expected, “Team” looks at cast, characters and performances. “Team” gives us some minor insights but remains fairly fluffy. One specific character becomes the focus of Oscar: The Handler. In this five-minute, 15-second piece, we hear from Gero, Alexander, writer/executive producer Christina M. Kim, writers/supervising producers Alex Berger and Brendan Gall, and actor Francois Arnaud. As expected, we learn more about Oscar as well as Arnaud’s performance. We get a smattering of good character notes. During the three-minute, 23-second Weller Takes Action, we locate notes from Stapleton, Gero, Alexander, Esparza, and stunt coordinator Stephen Pope. “Action” tells us a little about stunts and action, but largely it just praises Stapleton. Double Vision lasts three minutes, 39 seconds and offers info from Alexander, Pope, Gero, and stunt double Ky Furneaux. This show tells us a little about Alexander’s stunt double. Like the prior pieces, it mixes facts and fluff. Another supporting character turns into the focus of Rich Dotcom. It takes up four minutes, 43 seconds with details from Gero, Berger, Alexander, Stapleton, Schechter, Gall, and actor Ennis Esmer. This clip tells us more about the Rich character and Esmer’s performance. It resembles the “Oscar” featurette and becomes a decent overview. Effects dominate the four-minute, 55-second Make It GO Boom. It features Brown, Gero, Alexander, Stapleton, Pope and special effects coordinator Drew Jiritano. “Boom” looks at practical effects, with an emphasis on one scene with an explosion. It presents another decent but less than meaty short. Tattooed Clues occupies seven minutes, eight seconds and offers notes from Gero, Alexander, Jean-Baptiste, Berlanti, Stapleton, Schechter, Gall, tattoo designer Christien Tinsley and effects makeup Stephanie Pasicov. The featurette looks at the design and meaning of Jane’s tattoos. This becomes one of the more informative of the set’s pieces. A Bound and Gag Reel lasts four minutes, 26 seconds. It provides the usual array of goofs and giggles. While that makes it nothing special, the reel does seem a little more interesting just as a contrast with the series’ grim nature. Finally, we discover a 2015 Comic-Con Panel. This runs 15 minutes, 27 seconds and involves Berlanti, Schechter, Gero, and Alexander. The panel examines the series’ origins and development, story/characters, cast and performances, locations, and thoughts about fans. Nothing terribly insightful appears here, but the panel offers some decent thoughts. After a slow start, Season One of Blindspot turns into a fairly effective action/thriller series. I’d like more consistency but still think the show works pretty well once it gets into a groove. The Blu-rays offer good picture and audio along with a smattering of supplements. Blindspot doesn’t soar, but it creates a generally involving series.